Brazil held elections to choose its next president, and the current President Dilma Rousseff (image) won another term. She won by a very narrow margin. 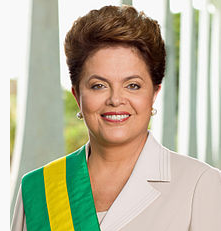 She has been the country’s president since 2011, and was Brazil’s first woman president. Brazil is the fifth largest country in the world (by both area and population). It was a Portuguese colony for over 300 years, and got its independence in 1822. 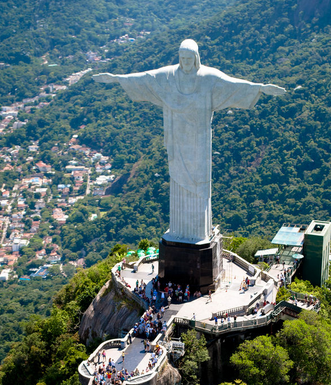 There are many famous things that are associated with Brazil – the Amazon Rainforest (the largest rainforest on our planet), the Amazon River (the second longest river in the world), the Christ the Redeemer statue (image, a tall statue of Jesus Christ overlooking the Brazilian city of Rio de Janeiro), the Copacabana beach (famous for its New Year’s Eve parties), the Rio Carnival (an annual street party), and the samba (a Brazilian dance). Brazil’s capital is Brasília, and its official language is Portuguese. One sport most Brazilians love is soccer. Brazil holds the record for the World Cup Soccer titles with 5 wins. One of the world’s famous soccer players is a Brazilian named Pele (real name is Edison Arantes do Nascimento). The country is one of the largest coffee exporters in the world. Brazil is the only South American country with Portuguese as its official language.